Find Japanese schools and courses that suit you the best. And learn Japanese in the most efficient ways. Usually, programs have up to 4 starting dates. Their lengths vary, from a few weeks only to 2 years, with about 20 weekly hours of class. In order to become fluent at Japanese, though, one should study at least a year. All language schools care about teaching Japanese culture and way of life as well. Therefore students can expect a lot of activities – cultural, social and others – off the school premises, and often in the school as well (for example Japanese cuisine, calligraphy …). Purpose of your study: If you are planning to study at a Japanese university, you need to select a Japanese language school that is accredited by the Japanese government and offers preparation courses for university exams – all of our affiliated schools are. These schools also offer other courses such as general or basic courses which are communication-based. Location: It depends on you: where you would like to experience life in Japan? Which city attracts you the most? There are language schools in the city and some are in the countryside. What climate suits you the best: cold Hokkaido (with great cool summers) or hot Kanto (with mild winters)? Do you intend to travel in Japan a lot? 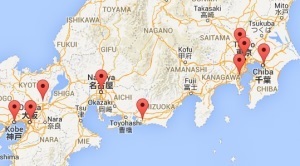 If so, a central position such as Osaka (Kansai) could be an appealing option. Budget: Japan is not a cheap country, so you need to consider the school’s location, the tuition fees and other expenses before deciding the school where you would like to apply and study. Duration and starting date: Intensive and General course duration is between 6 months and 2 years. There are usually 4 stating dates a year: in January, April, July and October. Many schools offer shorter courses which start every month. Teaching style: Before selecting a school, check with us the percentages of students’ nationality, as some schools mostly accept students from only one country (often Chinese or Vietnamese). This means that the teaching style will focus on those specific students needs and objectives. Intensive or preparatory courses: the usual purpose is to prepare students to go to higher education and thus to get them ready to take the JLPT test and prepare for the EJU for those who want to go to a Japanese university. Generally, you need to have a solid knowledge of Japanese language before you start those courses. General or Basic course: these courses are for people who are simply interested in Japanese language and culture, students who are not planning to enter a higher education institute but need to master the Japanese language for their career in their home country or for hunting jobs in Japan (or simply for their hobby and pleasure). It is also for business executives to effectively communicate in Japanese in business meetings, and be able to expresse ideas and opinions. Short-term courses: it is a course for students and business people who want to improve their Japanese language skills or brush up within the shortest period of time and often during their holidays. The course duration is between 2 weeks and 3 months (it varies from schools to schools). It is important to keep in mind that all schools have their own specifics. Contact us and tell us what you are looking for. We will help you find the most appropriate school for you. Check our Japanese Language Schools: click here.